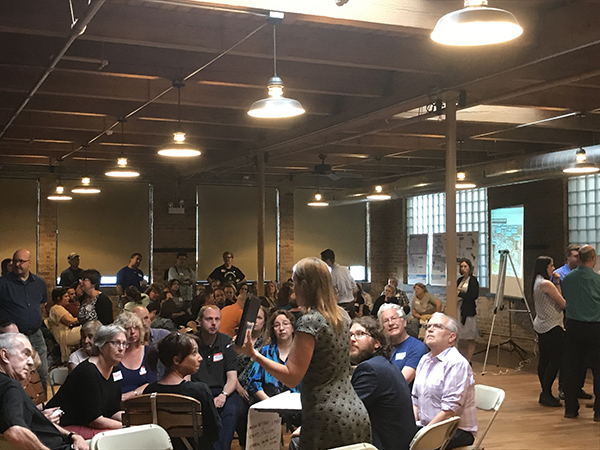 About 175 people attended a June 19 community workshop which was designed to gather input on how to improve the business climate and overall attractiveness of the area near the Jefferson Park Transit Center, 4917 N. Milwaukee Ave. It was part of the master planning process for Jefferson Park and included discussions on the following topics: community character and land use, economic development and housing, and transportation. The workshop was held at the Copernicus Center Annex, 5214 W. Lawrence Ave. The Regional Transportation Agency is funding most of the project’s $120,000 cost, and the consultant company Teska Associates is working on the project with Alderman John Arena (45th) and the city Department of Planning and Development. One of the workshop’s focuses was gathering input on why the business district has been plagued with vacant storefronts. Responses included absentee landlords who take advantage of vacant property tax breaks and unattractive or unsafe walking conditions that scare away potential customers. Concerns were raised that the viaduct on Milwaukee Avenue at the Kennedy Expressway is so dark and unappealing that it deters shoppers who would otherwise walk from their home north of the expressway to the Milwaukee-Lawrence commercial district to the south. Others said that the transit center lacks a designated pickup and drop-off area for commuters who are being driven to the center and that proper signage directing visitors is missing. Installing a kiosk with a map of the business district was among the recommendations. A woman said that the Metra platform, which is located above the CTA terminal, is isolated from the rest of the center and that at times she does not feel safe there. A better mix of businesses closer to the transit center which would appeal to waiting commuters also was suggested. In addition, the need to improve handicapped accessibility and pedestrian and bicyclist safety near the terminal also was discussed. Some participants suggested that designated bike routes be created on side streets such as Ainslie Street. 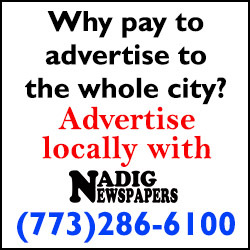 Concerns also were raised that the proximity of the Kennedy and Edens expressways make it easy for area residents to get to suburban shopping centers. Teska owner Scott Goldstein said that those same expressways also could be used to bring potential shoppers to the area from other communities. It was recommended that area’s cultural attractions, such the Ed Paschke Art Center at 5415 W. Higgins Ave., should be promoted at O’Hare Airport to those passengers who have a long layover. Drafts of plans for area’s revitalization will be presented at a community meeting this fall. Some residents said that any zoning recommendations included in the plan should strike the right balance of maintaining the area’s atmosphere of predominantly single-family homes and two-flats, while generating some increased density. A 16-story building with 114 apartments, a 200-space parking garage and several storefronts is planned for a parcel next to the terminal. Some residents said that smaller retailers nowadays are more interested in spaces with skylights and high ceilings than being part of a larger mixed-use development. Some participants noted that the commercial area has several large gaps with no storefronts due to a parking lot, a series of residential buildings or the U.S. Postal Service distribution center at 4810 N. Milwaukee Ave. They said that these gaps create challenges in encouraging foot traffic in the commercial area. About 550 people have taken an online survey for the project at www.accessjeffpark.org. The survey will be available until June 30. About half of the respondents said that they eat or shop in Jefferson Park once a week.